Much to the dismay of traditionalists, the Western tradition of celebrating Halloween is catching on across Eastern Europe, but All Saints' Day, on Nov. 1, and All Souls' Day, on Nov. 2, have been celebrated for centuries and still hold sway. Largely a Roman Catholic observance, Poland, Lithuania, Hungary, Croatia, Ukraine and other countries consider these two days a national holiday when shops, schools, and businesses are closed. On All Saints' Day, the faithful attend church to remember the saints and their dearly departed. People travel long distances to place flowers on the graves of loved ones and burn specially decorated candles to help the departed souls find their way to everlasting light. Sometimes, the parish priest says prayers or blesses the graves. Years ago, it was traditional for the family to have a sumptuous feast at the gravesite and leave food and drink for the departed. What might otherwise be considered a maudlin tradition is beautiful with cemeteries across the countryside lit by thousands of candle lanterns at night. The candles burn at least until the next day, All Souls' Day, also known as Day of the Dead in many countries, but often they glow in the dark for weeks afterward. 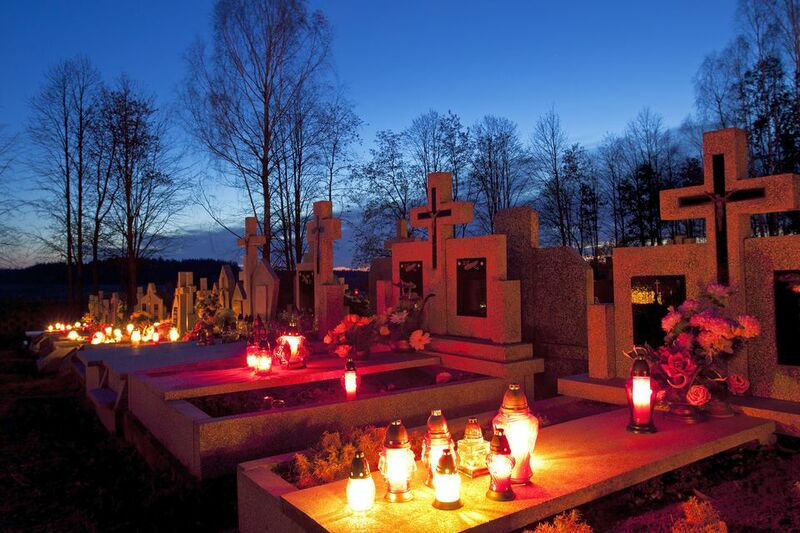 In Poland, All Saints' Day is known as Dzień Wszystkich Świętych and All Souls' Day is known as Dzień Zaduszny or zaduszki, when doors and windows are left open to welcome the spirits of the dead. In Warsaw, Pańska Skórka or the Lord's Crust is sold at the entrance to the cemeteries. This pink-and-white candy is like taffy or Turkish Delight (known as rachatlukum in Poland) and is a tradition specific to Warsaw. In Kraków, a similar candy is miodek turecki ("Turkish honey") but it contains nuts and is not specifically eaten on this day. In addition to traditional rituals, Romania has begun featuring The Real Dracula Halloween Tour in a concession to Western tradition and business pressures. Hungarians also celebrate traditionally by lighting candles at graves but expat-inspired events are growing in popularity. Czechs call Nov. 2 Commemoration of All the Departed and remember their departed ones with prayer, flowers, and candles. In Croatia, the Western tradition of celebrating Halloween has begun to invade the culture. A practice unheard of a few years ago has now blossomed into parties, horror film fests and trick-or-treaters ringing doorbells of less-than-receptive homeowners. In Russia, the black cat is not feared and blue cats (Russian Blue, British Blue, Burmese) are adored because they are said to bring good luck. Pumpkins, known as harbuz in Ukraine, have an entirely different significance than Western jack-o'-lanterns do. Dating from medieval times, if a man's proposal of marriage was turned down, the maiden's family handed him a pumpkin. The practice is almost nonexistent today but the expression "to get a pumpkin" means to get dumped or turned down in business or some other way. Serbians, Slovaks, Bulgarians and other Orthodox Christians honor their dead several times a year, usually on Saturdays, because Jesus was laid to rest in the tomb on a Saturday. In days gone by, and to some extent today, when someone died at home, all the doors and windows were immediately opened so the spirit would not be trapped in the house but could pass to the afterlife. Likewise, mirrors were turned to the wall or covered so the soul would not be captured in the room, and clocks would be stopped. At the funerals of Polish-born people not living in Poland at the time of their death, a handful of Polish soil, specifically brought from Poland by émigrés just for this purpose, is sprinkled on the coffin before it is lowered into the ground. This symbolizes the deceased’s return to the earth from where he came. In Poland, after the burial, there is a funeral banquet known as a stypa or meal of consolation known as konsolacja. Kasza (porridge) or kutia sometimes still are typically served along with vodka and honey, and other foods, depending on the family’s means. A toast is made to the deceased -- za spokój duszy (for the repose of the soul) or za pamieć (in memory of). But this is not a time for serious drinking. In the United States, it is customary to take a casserole or other dish to the family of the deceased so they don’t have to bother preparing food at a time of grief. The following is a recipe that has stood me in good stead when I needed a hearty, easy-to-reheat dish to take to a grieving person’s home or to a funeral luncheon. It’s also a great potluck dish. So, Do Monks Make Trappist Cheese?